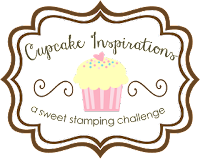 Happy Cupcake Inspiration Challenge! This is the first time I'm participating in this challenge and needed a birthday card so I wanted to have a hand at it. We are asked to combine a past challenge and a birthday card. I chose the past challenge #206. The colors are lavender, turquoise, and pink. Your card is as sweet as can be! I'm so glad you linked up to our 400th birthday celebration at Cupcake Inspirations! Oh wow! This looks fabulous, and it's perfect for our 400th challenge at Cupcake Inspirations! So glad you joined us! How nice to read this! YEAH!!!! Cupcake cards!!! Always love seeing these! And this one is especially beautiful! So glad you found us, and did your first challenge. It was a great one to join in on!! Thank you for joining us for our #400th challenge celebration!! !